INTERIORS & SOURCES: Tell us about your background. SHULI SADÉ: I am an interdisciplinary artist. I was trained as a visual artist and have been greatly inspired by architecture and design. I’ve taught classes at several A&D schools, including Parsons, the School of Architecture at the University of Pennsylvania, and the School of Architecture at Bezalel Academy of Art and Design. IS: How did you end up in such a specialized nook of the art world? SS: My interest in spatial perception and structural geometry makes architecture a great source of inspiration for my process. As a multi-disciplinary artist I often mix two and three dimensional concepts, alternating between photography, video, drawings, objects, and installation. Sculpting and building architectural models had given me some confidence with creating functional objects. Certain projects allow me to experiment with larger scale fabrications and give me the opportunity to collaborate with professional makers outside of the artist studio. I believe that’s what I was aiming for all along: collaborating with architects, designers, fabricators, and overall innovative clients on large-scale art projects related to specific places. IS: How do you think your work lends itself to interior design? SS: I think I like and understand the combination of both the functional and aesthetic sides of art. Working with interior designers and architects strengthens my ability to integrate more conceptual considerations into my art rather than just the purely aesthetic ones. IS: How did you come to investigate “encoded memory” (which you explore in your Reconfiguring Memory series)? SS: My interest in memory grew in the past decade. I worked closely with neural scientists inspired by their discoveries and methods of research of the brain and memory in particular. Made of particles, the photograph makes marks on a certain time in space. Codes are marks, a vocabulary of signs making an entire language. Early teletype machines were used to transport coded messages which needed to be decoded by the receiver. In coding and decoding there must be a sender and receiver. An artwork needs to be read by the viewer. I began to remove information from the photographs examining how far can I go with missing particles in order to be able to read the image. Working with these particles is like looking at an image through a huge magnifying glass. Photography is a tool that we use to remember. In this digital age we all relate to memory on a daily basis, storing or retrieving information from the past. Along with encoding and storage, recall is one of the three core processes of memory. Memory is the recollection of events or the ability of the mind or of an individual or organism to retain learned information and knowledge of past events and experiences and to retrieve it. IS: Tell us about the process of building the conference table built from an encoded memory photograph installed at the Center for Neural Science at New York University. SS: Reconfiguring Memory is a permanent art installation at the Center for Neural Science at Neurobiology of Cognition Laboratory at NYU. 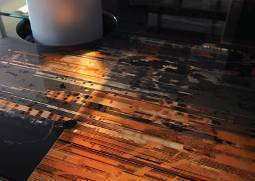 It includes three elements, one of which is the Encode/Decode conference table made of Galaxy Glass & Stone, stainless steel, and a photograph. I removed and retrieved memory from a night shot of Midtown Manhattan, taken from the 38th floor of the Renzo Piano-designed New York Times building. The total glass weight was a half-ton, placed on brushed stainless steel. An international group of neural scientists use the laboratory, where the conference table is the hub for exchanging new ideas. Reconfiguring Memory is an artistic affirmation that the best science is not conducted in isolation and through a microscope, but often through collaboration and the exchange of ideas. 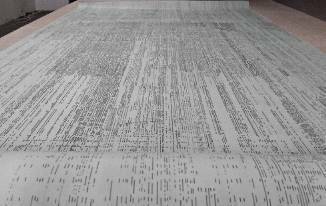 the Encode/Decode conference table, part of the “Reconfiguring Memory” installation at the Center for Neural Science at Neurology of Cognition Laboratory at New York University. IS: In your photography practice, why did you take to shooting at night? SS: My fascination with urban grids is heightened at night. Architecture and streets are reshaped in darkness. Color is reduced to black and white, negative and positive. A new urban system reflects a differently shaped city. In recent years I have worked with physical and digital memory, often comparing the grid in the brain to an urban map. SS: Engrams are a hypothetical means by which memory traces are stored as biophysical or biochemical changes in the brain (and other neural tissue) in response to external stimuli. The Engram Drawings are urban palimpsests systematically hand drawn with ink on draft film (60 x 110). Following a radical digital reduction of content I examine my own memory of the scene I had photographed by a refined repetition of geometries. Various memories spring up; forgetfulness makes its mark. The act of drawing brings back a physical methodical recording of the digitally eliminated memory. IS: What are decoded photographs exactly and how do you decide which parts to deconstruct, so to speak? 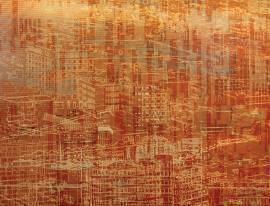 SS: Decoded-encoded photographs are cityscapes investigating memory loss and retrieval. These urban manuscripts form ghostly texts as overwritten, erased, and retrieved images that collapse time—eradicating, transforming, and rebuilding space. The geometry of missing particles unveils a grid of architectural rhythms that belong to large modern cities. Removing photographic information with a mechanical precision creates a new landscape, constructed from lost evidence within an existing landscape. The process of removal and recall of pixels from the original photograph is made digitally, randomly, or in order, either following the composed memory methodically or my own memory path while removing the pixels. Instead of working with an algorithm, I create manual removal systems. IS: Can you tell us a little bit about your latest project, Imprints? ABOVE The Encode/Decode table was built off of an Engram drawing, which is a system Sadé has of examining her own memory of a scene she’s photographed, and “drawing out” the parts she’s forgotten. SS: Imprints is a permanent, 65-foot art installation of custom laminated annealed glass composites and photographic film interlayers placed in the reception area of the Cozen O’Connor law firm’s international headquarters, designed by Gensler, in the heart of Philadelphia’s Central Business District. The level of transparency of the Galaxy Glass & Stone panels was carefully selected to create visibility for the movement behind the glass, signifying an infinite river-like flow and momentum, reflecting the two rivers bordering the city on both sides. 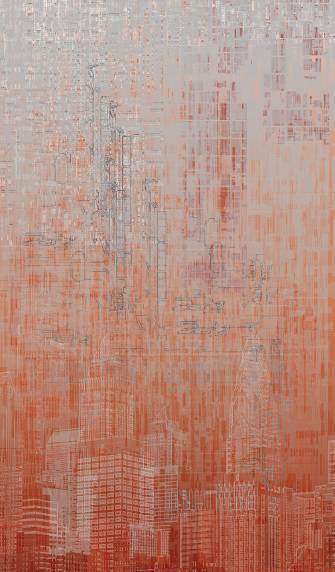 Imprints magnifies the space while capturing the energy of the city. I took 17 photographs from the 57th floor of the building that channeled views of the cityscapes and placed them in a centrifugal rotation of 360 degrees to create the images. Imprints heightens awareness and links viewers and visitors from within the space outwards, to the surrounding landscapes. This awareness maintains a balance between reality and metaphor, between the present and its memory, and creates a meditative ambiance reflecting an aura of the city from above. LEFT TO RIGHT The table is made from Galaxy Glass & Stone, stainless steel, and the photograph. The total glass weight was a half-ton. Architectural decorative glass manufacturer Galaxy Stone & Glass partnered with solid state lighting and control systems company Traxon Technologies to conceive MediaGlas, a customizable line of monolithic, laminated architectural glass products that can be used for a variety of backlit LED applications, from medium-resolution displays to color-controlled light emitting surfaces. Designed by Matthew Tanteri, principal of architectural lighting design firm Tanteri + Associates, based in New York and Austin, Texas, MediaGlas is specifically engineered for use with Traxon and e:cue LED lighting and controls. MediaGlas utilizes text, graphics, and lighting controls to relay information through multiple colors, intensities, directions, and timing options. MediaGlas allows for the configuration of various light-modifying elements, including diffusers, opacifiers, refractors, silvers, and view controllers. The collection also features preconfigured combinations of elements called compounds that hone in on point source LED arrays. 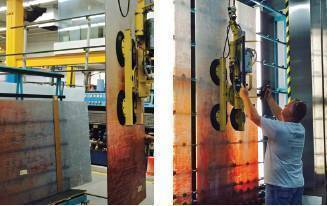 The glass comes in thicknesses that range from ¼ inch to 2 inches, and is available in continuous panels up to 14 feet in one direction. “MediaGlas enables the transformation of architectural glazed surfaces into optical elements suited specifically for LEDs,” Tanteri says. The unique combination of glazing and lighting allows designers to create feature walls and displays in retail settings and other environments that can visually dazzle, impart information, and convey the essence of a brand. Galaxy Glass & Stone released MediaGlas, in collaboration with Traxon Technologies, manufacturer of solid state lighting and control systems. A highly customizable line of monolithic and laminated architectural glass products specifically for use with Traxon & e:cue LED lighting and controls, MediaGlas can be used in a wide variety of backlighted LED applications, according to Galaxy. MediaGlas uses light-modifying elements that diffuse, disperse and reflect, satisfying both aesthetic and functional purposes, Galaxy officials report. 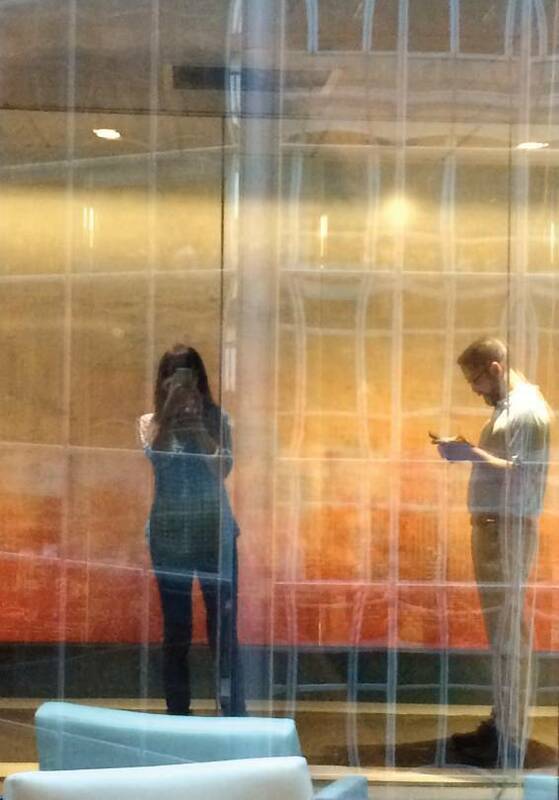 The combination of light and glass can be used to communicate information with text and graphic imagery in architectural applications, controlled by an e:cue Butler and Action Pad. Façades are becoming increasingly dynamic, and this includes functioning as a medium of expression. Projects around the world are integrating LED lighting systems with the glass, creating a façade offering an artistic expression or graphic communication. 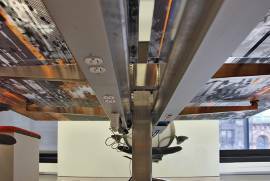 In March, Traxon Technologies, a company in the solid state lighting and control systems industry, partnered with Galaxy Glass & Stone of Fairfield, N.J., to offer MediaGlas, a line of monolithic and laminated architectural glass products designed specifically for use with its LED lighting and controls. The new development is available through Galaxy Glass & Stone exclusively and can be used in a variety of backlit LED applications, such as medium-resolution image displays and precisely color-controlled, light-emitting surfaces. MediaGlas is comprised of light-modifying elements that diffuse, disperse and reflect, while offering both aesthetic and functional purposes. The combination of light and glass creates infinite appearances and forms, and enables communication with text and graphic imagery in architectural applications. According to Eugene M. Negrin, president and CEO of Galaxy Glass & Stone, media façade technology is continuing to evolve. The contract furniture industry has done a good job creating walls for every occasion — walls that can be moved; those that are made of glass and wood; and walls that create glass storefronts. 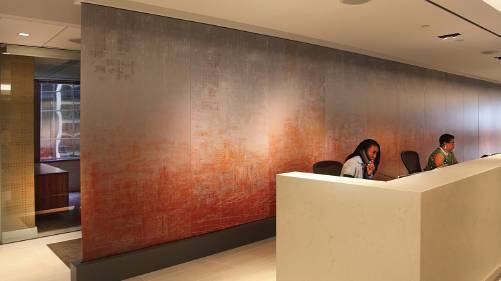 So image walls that acts as a chameleons — glass screens that can change colors and textures, show images, logos or text or project just about anything a designer could imagine. That’s exactly what Galaxy Glass & Stone’s newly introduced MediaGlas product is capable of. It will be featured at Lightfair International early next month. Consider MediaGlas a screen for the imagination. All complexity aside, MediaGlas is an architectural glass product designed for use with Traxon and its e:cue lighting and controls. MediaGlas is for use in a wide variety of backlighted LED applications, such as medium resolution image displays and precisely color-controlled light emitting surfaces. MediaGlas is comprised of light-modifying elements that diffuse, disperse and reflect the light. The combination of light and glass creates infinite appearances and forms and also allows information with text and graphic imagery to be “projected” onto the glass in architectural applications. Since the LEDs are controlled by an e:cue Butler and Action Pad, MediaGlas offers endless variations in color, intensity, directionality and timing. A MediaGlas wall might project a company logo, which can be changed into a holiday display throughout the year. Or perhaps it might just change colors to change the look and feel of the room. MediaGlas was launched by Galaxy Glass & Stone, a custom manufacturer of architectural decorative glass in collaboration with Traxon Technonologies, a company that makes solid state lighting and control systems. Galaxy Glass & Stone was founded in 1977 by Eugene M. Negrin, and since has become known by the international architecture and design community as a premier custom glass fabrication facility. Galaxy Glass & Stone has been in the architectural glass business for the last 38 years and during that time, has worked on some of the finest glass projects in the world, most architectural, some artistic and architectural. For example, the New York University research laboratory located in the center for Neural Science features a unique meeting space that reflects its culture of innovation and inspiration. Showcased within is an art project by internationally recognized artist Shuli Sadé entitled Encode/Decode. Made up of three inter-related art pieces, Reconfiguring Memory consists of Encode/Decode, Traces and Remapping, all created by Sadé to serve the Neurobiology of Cognition Laboratory. 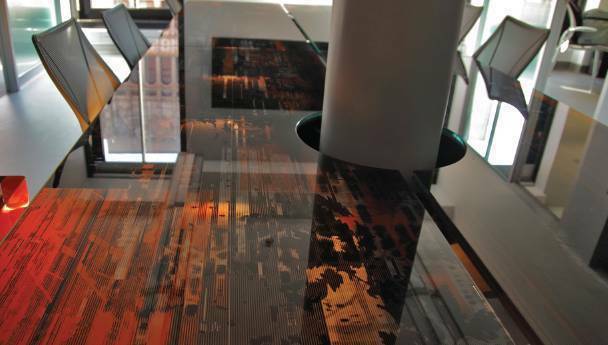 Encode/Decode is a spectacular conference table art piece that is the result of a two-year collaboration between Artist Shuli Sadé, Dr. André Fenton, Professor at the Center for Neural Science at New York University and Galaxy Glass & Stone. This 15 by 5 foot conference table which weighed in at a half ton was fully fabricated by Galaxy and serves as a representation of the state-of-the art understanding of memory and its expression. 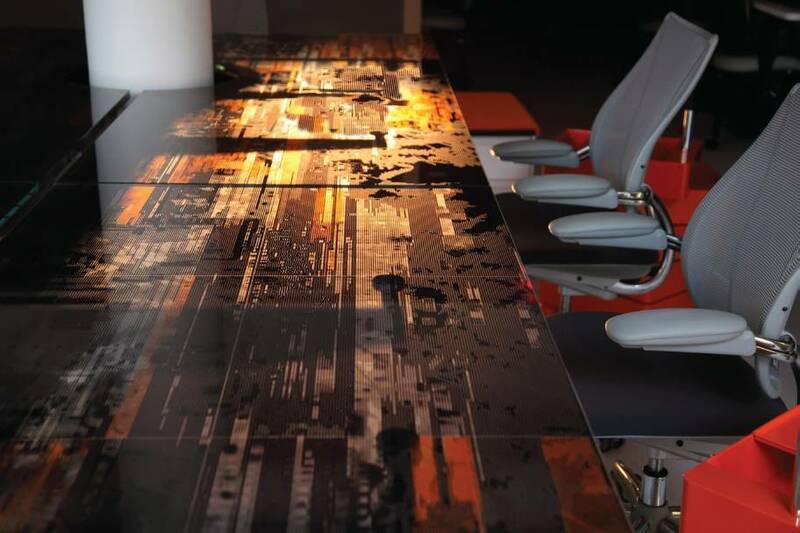 The Encode/Decode conference table is comprised of 32 photographic panel fragments of a single photograph featuring a New York City nightscape. Also incorporated in the photograph are urban and natural visual textures. Sadé digitally removed pixels from the photograph, signifying the stochastic loss and gain of information that is fundamental to memory storage. Architectural elements appear as immunoblots, a biochemical research technique that is routinely used for revealing the molecules that store and regulate memory. Striping in the images resembles the raster displays used to represent electrical discharge of neurons within brain networks. 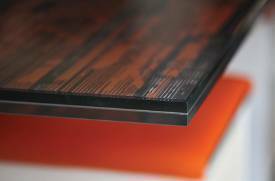 Galaxy Glass & Stone manufactured the finished table as an inch-thick Galaxy UL Silkglas 500 Custom Laminated Glass Composite that encapsulates the digital film interlayer. The table was constructed in four sections which were assembled and installed onsite. In order to mitigate the uneven distribution of the weight, Galaxy engineered a custom stainless steel, satin finish support structure, which included a column enclosing base, spine and fully welded outrigger arms. The table was then anchored into the concrete sub-floor. Hidden in the base are Wiremold raceways that support built-in lighting as well as power and data outlets. Another notable feature is the highly polished edge work, something Galaxy is well known for within the A & D community. While Encode/Decode is art created in glass, MediaGlas allows the imagination of the designer to create the art and change it along the way. Still, Galaxy’s expertise is in glass. Traxon brought its expertise in lighting and control to the table. MediaGlas comes in two forms, one with a smaller LED pixel board, which can program color and shape and a larger LED pixel board that can stream video, special effects, signage or verbiage. It creates a nearly limitless language for the designer. Though corporate projects are a natural — imagine a reception area that can change colors, display information or project a company logo — there is also strong interest for transportation uses like displaying information in airports. Retail and fashion uses abound as well. You could “repaint” your wall with light every day. Or you could change the complexion of the room with different patters and colors. The use of glass and LEDs could change everything from the look of your office to your favorite retailer. MediaGlas is at the architectural forefront of this revolution. Galaxy Glass & Stone® announced that their newly introduced MediaGlas ™ product will be featured at Lightfair International, May 5-7th, 2015 at the Jacob Javits Center in New York. (Traxon Technologies booth # 1922). MediaGlas ™ is a highly customizable line of monolithic and laminated Architectural Glass products designed specifically for use with Traxon & e:cue LED lighting and controls. Released just last month, MediaGlas ™ was launched by Galaxy Glass & Stone®, a custom manufacturer of Architectural Decorative Glass in collaboration with Traxon Technonologies, a global leader in solid state lighting and control systems. Exclusively available through Galaxy Glass & Stone®, MediaGlas ™ is for use in a wide variety of backlighted LED applications, such as medium resolution image displays and precisely color-controlled light emitting surfaces. MediaGlas ™ is comprised of light-modifying elements that diffuse, disperse and reflect, while offering both aesthetic and functional purposes. The combination of light and glass creates infinite appearances and forms, as well as enables the communication of information with text and graphic imagery in architectural applications. Intelligently controlled by an e:cue Butler and Action Pad, MediaGlas™ offers endless variations in color, intensity, directionality, and timing. Collaborating with wall-decor manufacturer 4walls, Galaxy Glass & Stone has expanded its offerings with new graphics that range from flocked patterns to nature motifs. The imagery can be scaled to different sizes and is encapsulated in glass for use as walls in office, hospitality, retail, health-care, institutional, and even residential settings. The designs come in opaque, transparent, translucent, or satin finishes. FAIRFIELD, N.J. (January 15, 2015) – Galaxy Glass & Stone® partners with 4walls® to introduce the Galaxy + Level Design Collection™: sophisticated, eye-catching artwork encapsulated in elegant Architectural Decorative Glass.